Make this the BEST New Year’s Eve EVER when you purchase an iPlay America NYE PARTY PASS! It’s the FAMILY EVENT OF THR YEAR and the perfect way to celebrate! iPlay America’s New Year’s Eve Party Pass includes unlimited rides, a $10 game card, party favors, spectacular prizes and giveaways throughout the evening, a confetti cannon, light show and great music playing in the entire park, with a live D.J., all for just $39.99! Buy NOW and save at iPlayAmerica.com/NYE! Tickets will be $49.99 at the door. Looking for something extra-special to celebrate this New Years, iPlay America is offering a limited number of VIP Suite packages! Join in iPlay America’s huge NYE festivities and be here to watch the ball drop on one of our five large screens and monitors! Get Inside the FUN! Tickets on sale NOW at iPlay America.com or call 732-577-8200! iPlay America in Freehold, NJ. iPlay America, home of New Jersey’s original indoor boardwalk, invites families, friends, couples, teens — and everyone looking to ring in this New Year — to have a blast during the Sixth Annual New Year’s Eve Party from 7:30 p.m. - 1 a.m. Saturday, Dec. 31. It’s the family event of the year! Everyone can expect a thrilling evening of over-the-top fun! iPlay America has been setting the standard for New Year’s Eve party FUN for five years, and NOW they are pulling out all the stops to make this New Year’s celebration spectacular! iPlay America’s New Year’s Eve Party Pass includes unlimited rides, a $10 game card, party favors, spectacular prizes and giveaways throughout the evening, confetti cannons, light show, and great music playing in the entire park with a live D.J., all for just $39.99. Buy NOW and save. Tickets will be $49.99 at the door. Party-goers who are hungry for more than just a good time may purchase tasty à la carte treats at Sonny’s Boardwalk Grill, Boardwalk Bites, and Mixx Frozen Yogurt throughout the celebration. Guests can also make reservations at Game Time Bar & Grill and enjoy a delicious selection of à la carte items or enjoy dining from a prix fixe menu on a first-come, first-served basis. An adult cocktail area will be available. For revelers looking to do something extra-special to celebrate this New Years, iPlay America is offering a limited number of VIP Suite packages. Packages are base priced for groups of 12 and depending on the size of the Suite booked, can accommodate up to 24 guests. Packages include special food and drink options and are designed for those seeking a more intimate, private party experience. Availability is limited, but the knowledgeable party planners at iPlay America are ready to listen and provide guests with the BEST New Year’s Eve experience ever! Book NOW! Call iPlay America at 732-577-8200 ext. 382 to reserve a VIP suite today. Make plans NOW to be a part of ALL the pizzazz, pop, and pageantry of iPlay America’s huge New Year’s Eve festivities and be here to watch the ball drop on one of our five large screens and monitors. GET INSIDE THE FUN! Race, fly, ride, spin, climb, play, and celebrate your way into 2017 at the No. #1 indoor boardwalk amusement park in New Jersey. iPlay America’s Sixth Annual New Year’s Eve Party is family FUN at its finest. Children two and under are FREE. Tickets are on sale now! Make your reservations today and have the BEST NEW YEAR’S EVE EVER. iPlay America is located on Route 9 at 110 Schanck Road in Freehold, New Jersey. 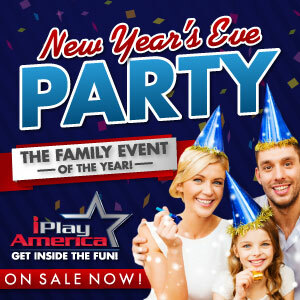 Visit iPlayAmerica.com/NYE to buy tickets.